Estimated delivery times are quoted on the product pages for each item. We shall make every effort to fulfil your order by the estimated delivery date provided. However, in rare cases, circumstances beyond our control may prevent us doing so. We will advise you of any delays and do our best to deliver your order as quickly as possible. Delivery dates do not form any part of the contract with us and no compensation will be offered for late deliveries in any event. If your item has not been dispatched and delivered within 30 days from the date of purchase, you may exercise your right to cancel for a refund. Some large/heavy items or multiple item orders are supplied on non-returnable wooden pallets. Due to the weight and size of certain products, pallets may need to be used in order to deliver such items safely. It is the customer’s responsibility to dispose of the pallets; we are unable to remove them. A delivery day will be arranged however deliveries cannot be booked in for a specific time slot. Following delivery, we highly recommend that any faults, missing items or damages are reported as soon as possible. This may allow us to resolve any issues more swiftly for you. Please retain all packaging until you are happy that there are no faults with your product. We ship to UK addresses only, however there may be a surcharge to deliver large goods (indoor & garden furniture, large BBQs, items over 20kg) to the Scottish Highlands, off-shore Islands, Channel Islands, remote locations and Northern Ireland, even if delivery is stated as free. If a surcharge is required, we'll contact you after an order has been placed, to take surcharge payment if you wish to proceed with your order. We base surcharges on the amount we are charged by our carriers, we send via the cheapest option and our policy is to never profit from a delivery surcharge. For offshore and overseas deliveries; should you wish to arrange your own shipping agent on the mainland, please contact us for further assistance. Certain orders may require a signature upon delivery. Should you wish to make a request for orders to be left in a ‘safe place’ with no signature (and it has been agreed with us), we cannot accept liability for items left unsupervised. If you provide a shipping address relating to a work place or a public place, please note that once the order has been delivered, the responsibility for the product lies with the cardholder and any loss/damage is then at your own risk. Also, a signature of any authorised body is deemed to be proof of delivery. In the case of a delivery being refused or you are not in at the agreed time at the delivery address, we reserve the right to charge a re-delivery fee. This applies to all indoor furniture orders and orders where a delivery date and time has been specifically arranged with a customer. Please note this can cost up to £85.00 per item/pallet depending on the size and weight, so we highly recommend you contact us at least 48 hours prior to the arranged delivery date if you foresee any potential issues with delivery. Please note that all garden furniture, large bulky items and pallet deliveries are kerbside only, unless stated otherwise. Home & Garden Centre uses external delivery companies and we cannot ask delivery drivers to assist with the moving/handling of your item into houses, outbuildings, garages, up multiple steps/stairs etc. When ordering bulky/heavy items, please ensure you have the means to handle these items when delivery is received and that you are able to dispose of the packaging material. We use Royal Mail for delivering Gift Vouchers. All National Garden Gift Voucher orders over £60 are sent by Recorded Signed For (up to £105) or Special Delivery Next Day (over £105) and need to be signed for on delivery. Cut off time for next day delivery is 2pm. Any orders placed after 2pm on Friday will be dispatched the following Monday (excluding bank holidays). See our Terms & Conditions for policy on replacement vouchers due to non-delivery. If there is no-one available to sign for the National Garden Gift Voucher(s) on arrival, a card will be left by the postman informing the occupant that an attempted delivery was made. The Gift Vouchers will then be taken to the local Royal Mail Enquiry Office, where they will await collection by the recipient. A suitable form of identification (such as a utilities bill bearing the relevant address) may be required when collecting Gift Vouchers. Should your National Garden Voucher(s) not be collected within 14 days, Royal Mail will return the vouchers to us at which point we will endeavour to contact you to arrange a suitable alternative delivery address and date of delivery. We can deliver to addresses all across the UK including the Channel Islands and Scottish Isles. Despatch of National Garden Gift Vouchers is from mainland UK - please allow extra time for your order to arrive if sending to remote locations, Highlands or offshore locations. Unfortunately we do not deliver anywhere else. Some furniture orders may attract a surcharge to deliver to the Scottish Highlands, off-shore Islands, Channel Islands and Northern Ireland. If an arrangement for delivery is broken, a re-delivery charge will apply and is paid direct to the transport company. In certain cases this charge may be more than the original subsidised delivery charge paid. Please note this can cost up to £80.00, so we highly recommend you contact us or Kelkay directly, at least 48 hours prior to the arranged delivery date if you foresee any potential issues with delivery. Most furniture sets, large/heavy items or multiple item orders are supplied on non-returnable wooden pallets. Due to the weight and size of certain products, pallets may need to be used to ensure that items reach our customers in perfect condition. A delivery day will be arranged however deliveries cannot be booked in for a specific time slot. If an arrangement for delivery is broken or the delivery is refused, a re-delivery charge will apply and is paid direct to the transport company. 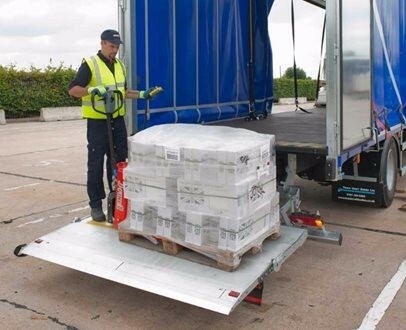 Please note this can cost up to £60.00 per pallet, so we highly recommend you contact us at least 48 hours prior to the arranged delivery date if you foresee any potential issues with delivery. We use external delivery companies, unfortunately this means the delivery drivers cannot assist with the moving/handling of your item into houses, outbuildings, garages, up multiple steps/stairs etc. When ordering bulky/heavy items, please ensure you have the means to handle these items when delivery is received and that you are able to dispose of the packaging material and wooden pallet. Access must be suitable for a long heavy goods vehicle with rear tail-lift offload. Delivery will be to nearest kerbside or hard-standing. Please ensure that the surface is smooth and level to unload onto. Please contact us if there are weight, height or parking restrictions or difficult access points before your order is dispatched so that we can arrange alternative delivery methods. Failure to do so may result in a re-delivery charge. We are able to offer a premium 2 man delivery service on certain large, outdoor furniture orders. This bespoke delivery service allows the driver/s to take the goods to your garden (or anywhere on the ground floor) for you. There is also no need for the goods to be secured to a wooden pallet, so you do not need to dispose of any pallets yourself. Deliveries are made Monday-Friday. You will receive contact from the courier, providing you with a delivery day and a 3 hour time slot. If the date is unsuitable, an alternative date will be provided. Please note that you may not be able to suggest a specific delivery day and time, due to the route planning process.